Make your '05-'08 Dodge Magnum stand out from the rest with this great-looking Hood Graphics kit. As you can see, this stripe package is not just a set of 20" strips in a box. Our graphic kit consists of prefitted and contoured pieces as shown in the illustration. 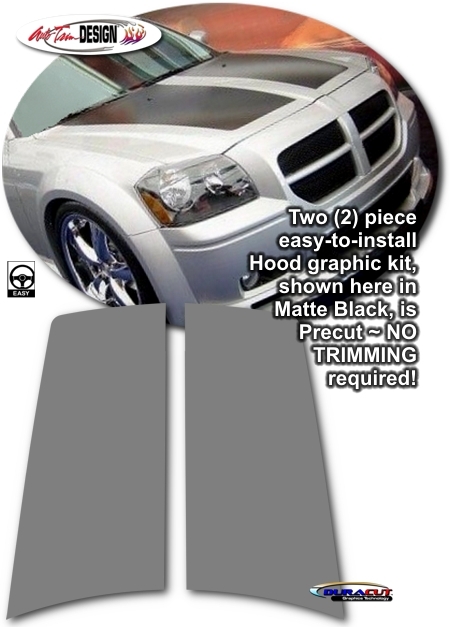 This kit is specifically made for the '05-'08 Dodge Magnum factory hood as shown and will not fit any other vehicle. Difference between the two (2) kits listed herein is that the '08 Dodge Magnum's Hood features distinct indentations within which kit #ATD-DDGEMGNMGRPH12 is designed to be applied.